← Who chooses the end of the world? Some writing news to begin with: I was notified this month that I’m a Baen Fantasy Adventure Award Finalist for a non-western, non-medieval fantasy novelette of mine. I also sold my flash piece “Interdimensional Trade Benefits” to Nature Futures; this will be my second appearance in that prestigious journal. You can read the first one, which in no possible way expresses my view of the socio-political arena of what we call modern civilization. Lastly, Creepy Campfire Quarterly bought a reprint of my sci-fi horror story “The Nightmare Lights of Mars”, which was a 2013 favorite of Alasdair Stuart on Escape Pod and narrated to perfection by vocal artist Veronica Giguere. CCQ’s editors were very enthusiastic about their enjoyment of the story, which is always a delight for any writer. Stories are meant to be shared, after all. It’s my pleasure to contribute this darkly dreadful glimpse into an especially nightmarish event on the redworld. 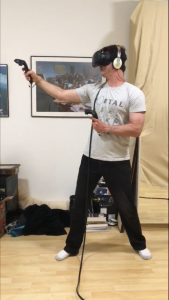 I recently had the chance to try out the Vive; my first real foray into virtual reality since playing Dactyl Nightmare back in the hallowed days of 1993 when such VR headsets were heavy enough to compress the cartilage of your nose. 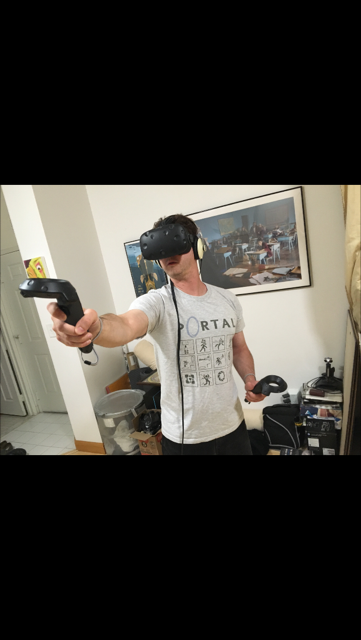 Technology marches on: my friend Colin recently picked up a Vive and invited me over to test-drive it. The headset is light, the graphics bright. Over the course of the evening, I defended myself against malevolent floating robots, delivered packages across lunar outposts, worked as a line cook, played a Tron-like version of tennis, sketched three-dimensional pictures in mid-air, played billiards, and shot at skinless zombies. As tired as I am of the undead, when you’re standing “outside” in the dark, a flashlight in one hand and a pistol in the other, seeing skinless corpses shamble towards you while you frantically reload, you’re fully immersed in the experience. An ancillary and unintentional benefit was that Colin had fans blowing in the room, and this added another layer of immersion as I stood in the “outside” of the virtual world, watching the trees sway and feeling the breeze as I hastily scanned for targets. Interestingly, the game that made my jaw drop the most was the pool game. As I lowered the goggles to my face and waited for the game to boot up, I was expecting to see a billiards table and little else, like Jack Klugman in the concluding scene of The Twilight Zone episode “A Game of Pool”. Which is to say, a billiards table surrounded by a cloudy background of Kryptonite fog. Instead, I materialized in a fully realized dive bar. Multiple tables, flatscreen TVs on the walls, a bar, beer bottles (which you can totally throw around or smash with your cue-stick), and even NPC people going about their own looping algorithms. It’s not the Metaverse, a Holodeck, or the Oasis. It’s also fairly rudimentary; mostly, the current crop of games are glorified demos hinting at the next stage of VR. But rest assured, you can see that near-future stage from where we’re standing. VR isn’t a fad anymore. We’ve taken the first real, tenuous step. 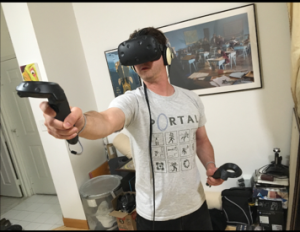 Virtual and augmented reality are mainstays of much of my fiction. “Love Among Dead and Crawling Things” explored the dark future of social media and online tribalism through augmented reality. I also used virtual worlds as a deliberate point of contrast to the Jain perspective in “Karma Among the Cloud Kings.” And it formed the setting and thesis for “Disc Sutter”. Technology is neither good nor bad, of course; it’s the application that matters. VR and AR are the latest evolution of old-timey magic lantern shows, but they also represent a fork in the road: as shadows on Plato’s cave, or as new venues for immersive storytelling and wonder. As a writer I’m concerned with the former. As a gamer, I’m in the latter camp. VR is, after all, my latest step on this yellow brick road. My first foray into games was at a local Carvel, where I would plug quarters into the coin-op cabinet of Asteroids. 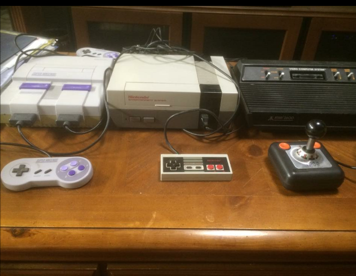 That was followed by the wood-paneled Atari 2600 home console (the 1970s even required electronics to have wood in them, apparently), a Nintendo Entertainment System, a Super NES I bought in college, the Playstation 1 and 2, the Xbox 1, 360, and One. I was never one to jump on the next platform bandwagon because of hype; it was the software that convinced me to take the plunge. I asked for my first NES for Christmas because the sight of a friend playing Castlevania blew open the dimensions of my 8-bit experience up until then. I abstained from the Playstation until I saw the witnessed the first Tomb Raider in action. Hell, I was happily late jumping on the Xbox One train because the crop of early titles failed to impress until the recent harvest. 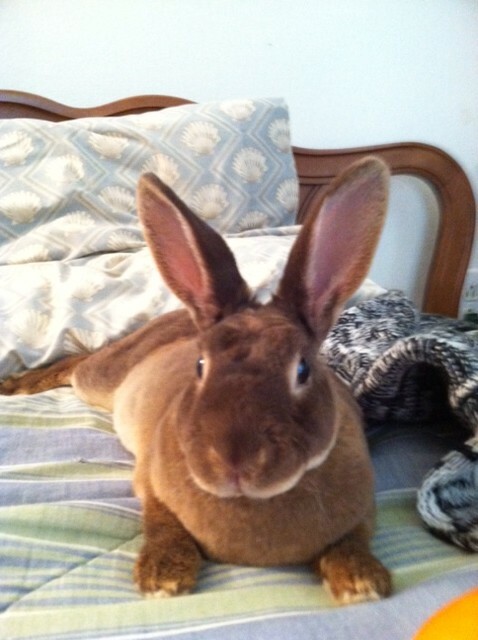 My remaining rabbit, Lily, passed away this month. She was five years old, in perfect health as best I could tell. I had been unable to sleep that night—the heat really screws with my sleeping habits. So I went into the kitchen, poured myself a whiskey sour, and read one of my all-time favorite novels by the thin luminosity of starlight coming in through the window. Lily sat in her cage watching me (I only cage rabbits at night or if I’m going to be away – at all other times they have the run of the house.) Twice I got up, knelt beside her, opened the cage, and pet her, rubbing her cheeks and head as she likes. Around 2 a.m. I went to bed. Four hours later I got up for work, walked into the kitchen, and found her dead. Eyes open, ears up. As if she had been frozen in suspended animation. As if she’d been taxidermied. For the first time in five years, I am now truly petless. It makes for an interesting bookend across a spectrum of change. Never having had pets before, I never felt an absence of them; my universe of me, friends, family, and girlfriend constituted a complete set. Now, having expanded those variables, the equation is forever different. Oliver Wendell Holmes once said that “Man’s mind, when stretched to a new idea, never returns to its original dimensions.” Maybe the same is true of the heart. This entry was posted in Blog and tagged Atari, Baen, castlevania, consoles, Futures, Holodeck, Lily, Metaverse, Nature, Nintendo, Oasis, playstation, rabbits, Tomb Raider, Valve, Vive, xbox. Bookmark the permalink.